Is it just coincidence there are lots of grisly deaths connected with Damien, or is he the spawn of the Devil. Many dismiss Damien: Omen II (1978) as the most forgettable of the original Omen trilogy. The Omen film series telling of those exploits of one Damien Thorne, aka the son of the Devil from birth until… It has one of the most easily recognisable musical scores of this time, Ave Satani. I’d watched the first three Omen movies, back in the day with my dad. Along with equally silly almost comic horror gems as The Medusa Touch (1978), The Hand (1981) and The Man Who Haunted Himself (1970). These films had more memorable leading actors than music with Richard Burton, Michael Caine and Roger Moore respectively. As I remember on watching this particular Omen film at my first viewing, that I didn’t know any of the cast. I only recalled it as not being as good as the other two and about a teenage Damien. And that was about it. So over a couple of retro horror themed movie nights, Darlin’ Husband and I re-watched the box set of the Omen trilogy franchise with the first followed by the third. We both had no problem with skipping the second movie, as like me Darlin’ Husband dismissed it as hokum. However not long after that, I discovered that the stars of this movie were actually as prolific as those others in that trilogy. As after joining this year’s William Holden tribute I discovered he was the top billed actor in this film. With Nicholas Pryor, Lew Ayres and Robert Foxworth supporting him. Holden’s leading lady, was an actress who has probably starred in more of my guilty pleasures than anyone else so far , Lee Grant. And an actress I reviewed in those other memorable roles as Queen of the Bee B Movies in The Swarm (1978) and Airport 77 (1978) (also with Foxworth). And Lance Henriksen. So with a sterling seventies cast like this, I really couldn’t review anything else. This film’s plot starts a week after the first film’s story line finishes. In a wee epilogue, we are reintroduced us to the archaeologist and Antichrist specialist from the first movie, Carl Bugenhagen (Leo McKern). He is seen gittering wildly to a friend Michael (Ian Hendry) about evil, wee Damien Thorn, a child who he says is Satan’s spawn. He believes many people’s untimely deaths are linked with the child. Which their deaths are, to be fair but without giving away any spoilers of the who, how and when from that famous cast from the first movie. Which included – in no particular order – Billie Whitelaw, Patrick Troughton, David Warner, Lee Remick and Gregory Peck. And introduced us to the evil one from birth to about 5 years old. But it did end, with wee Damien being looked after by the US President but how, when and why is revealed in the movie. But I digress and back to Omen II. Bugenhagen has read in a newspaper that this kid is now living with his Uncle Richard Thorn. Bugenhagen tells his friend, Michael that Damien has a birthmark resembling the numbers 666 on his head and says he can only be killed using seven legendary daggers. And asks his friend to take a letter about this child and those daggers to his now guardian. His friend doesn’t believe him (and tbh who can blame him). So Bugenhagen takes Michael to Yigael’s Wall which has a wee natty Damien themed mural of the boy in illustrations throughout his life (with then no indication of a third movie let alone those TV movies). Then the tunnel collapses with Bugenhagen, pal and box all drowning in sand. Flashforward seven years, Damien (Jonathan Scott-Taylor) is now 13 and attending military school with his similarly aged cousin, Mark. Damien seems a pleasant enough kid on first impressions, he seems to have a loving relationship with his Uncle Richard (Holden), Auntie Ann (Grant) and Mark (Lucas Donat). So while the boys are returning to school by car, Richard and his second wife Ann are entertaining a visitor, Richard’s elderly Aunt Marion (Sylvia Sidney). Marion tells the adults, there’s something about Damien she just doesn’t like – after all his brother Robert did try to kill him – and she thinks he’s a bad influence on Mark. So she vents all at a dinner with Ann and Richard. Even the presence of the Thorn Museum’s curator Dr Charles Warren (Pryor) doesn’t stop her outburst. Marion dislikes Damien so much so that she will even cut Richard out of her will if he continues to send the boys to the same school. Needless to say Richard and Ann are horrified at her outburst, both believing the best in young Damien. With Ann becoming terribly angry at the dotty one’s ramblings. The calmer, though angry Richard dismisses Marion as crazy, placates his irate spouse. And as Marion retires for the night, Richard and Ann are shown a slide show showing new artifacts for the Thorn Museum. Pryor shows a slide of a journalist, Joan Hart who saw the Yigael’s Wall’s mural. Hart is now keen to meet with Richard for an interview. Meanwhile a raven appears in Marion’s bedroom, then that ominous Ave Satani music… and she dies of a heart attack.. Meanwhile the boys are at military school with the only evidence so far Damien’s a bad un is trying to procure a cigarette from the family chauffeur. The boys meet new Platoon Officer, Sergeant Daniel Neff (Henriksen), who says he wants to excel in his new post. Meanwhile Richard is rescued from his apparently dull work at Thorn Industries, by Ann who has discovered Aunt Marion’s lifeless body. On leaving work Richard encounters Hart who barges her way into his car, he throws her out when she starts ranting about Damien, the wall and someone she feels died because of Damien. So the journalist goes to see Damien for herself, and is spooked out when she sees him. And then on driving home that Thorn bird appears… and Hart’s car engine stops working…. The film on watching it again, had to its credit a wonderful wee epilogue preparing you with that essential information needed for the second movie. It was useful in telling you who Damien was and how he could be killed. But it did assume that you had seen the first movie, by giving away the most significant part of the ending. And as Bugenhagen and his friend died in the sand… it set the movie up for more characters who on finding out Damien’s identity, lead to their gruesome, untimely deaths. With the Thorn Bird in tow, Damien almost decimated the cast. And it almost turned into a Casualty (1986-) episode where you could spot the victim and the way he would die before it happened. Although at times the use of dummies was almost laughable, there were a few genuine horror filled scenes. I loved William Holden in this film, playing the mild-mannered, genial uncle throughout and almost a bit too trusting of Damien, as his “innocent” nephew. However with his character only getting the reports of those deaths – and us getting the full story of Damien from all and sundry – it was to him these must have merely looked coincidental. Holden played the supportive, protective uncle, father and husband role amiably with all the cast. Even after he found the evidence appearing to incriminate young Damien, he trusted him. His on-screen rapport with his screen wife Grant was quite sweet, warm and touching. Their scenes showing their closeness as a family with the younger members of the cast almost like they were in a completely different movie genre. Less horror, more schmaltzy family movie. But to me, Damien’s close relationship with his uncle could have been developed further, especially after Damien became upset after he discovered his true identity. After seeing the second film again as much as I enjoyed it I found some parts of this sequel’s story line frustrating. The first film shows a quite possibly disturbing cliffhanger to the film, where young Damien is being cared for by President of the US of A. So why not carry on that story line, it certainly would be a far more interesting premise than Thorn Industries expansion subplot. Which was a bit bo-ring. The story could have then continued as it did, but with this particular Presidential guardian, a bit of a twist. It would have been interesting to see how the White House would have coped with the bodies piling up. This part of the story line instead was ignored, and not even mentioned. Another part of the story line, but left hanging was that Ann was noted to be Richard Thorn’s second wife. As his first wife was never mentioned, we could possibly go down the conspiracy theory line believing Uncle Richard knows his nephew, Damien killed her – and therefore his true identity – is covering up to all and sundry. Instead of leaving you wondering if the relevance of this fact was cut out of the film. 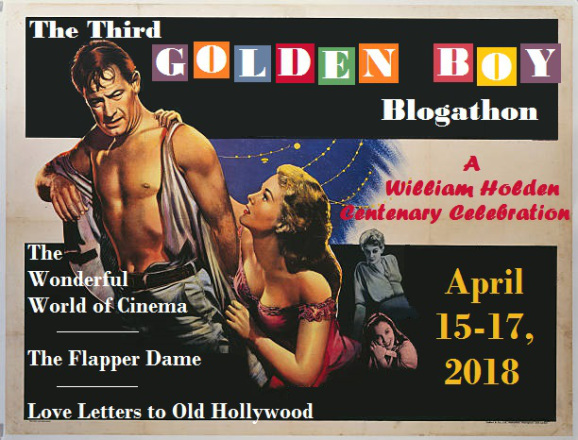 This film review was added to The Wonderful World of Cinema, Love Letters to Old Hollywood and The Flapper Dame‘s The William Holden Centenary, 3rd Golden Boy Blogathon. Other film reviews here with this cast include William Holden in Network, The Towering Inferno and Bridge on the River Kwai. Sylvia Sidney stars in my Magnum, The Love Boat and Mars Attacks posts. Lee Grant stars in The Swarm, Columbo and Airport 77. Robert Foxworth also stars in Airport 77, Murder She Wrote and Columbo. Nicholas Pryor was in these films and TV reviews… Less Than Zero, Knight Rider, Dynasty, Dallas. MASH, Hart to Hart and Murder She Wrote. Lew Ayres starred in Hotel and Fantasy Island. Leo McKern stars in Murder with Mirrors. Ive got a funny story about this movie- i t was airing on a Movie station- that my family doesn’t regularly get but it was airing on a free weekend-. My mom put it on the DVR and she didnt love it- fast forward through most of it- but she made sure to show me a part William Holden was in just because I adore him!! Thank you so much for writing this post on Bill! and sharing your admiration for this man! Hope you got to appreciate more of his role now, and have the time to watch it now in its entirety! Thanks for having me in the blogathon!! Great review! It sounds like quite an intense film! I must admit I’m not really into horror movies and haven’t seen any of the Omens (I remember seeing clips from the first one at the cinema museum in Torino) but I guess just the fact that William Holden stars in it should be a good reason to see it! The way you describe his character makes me believe that it’s a character and performance I should enjoy! Thanks so much for your participation in the blogathon! Thanks for having me, it is worth it for Hlden and Lee Grant but its more horror comedy at times,There is a nice wee homage to Hitchcocks The Birds so if you’ve seen that, everything else is just a wee bit daft and fun in comparison. Thanks for having me in such a fun blogathon! That scene is as horror as it gets, the rest are more amusing than horror. Do give it a try! I think this entire trilogy is solid. The first one is the best, but two and three are very good and have plenty of creepy moments too. I liked William Holden and Lee Grant in this one. I wish that Jonathan Scott-Taylor had made more films he was very good as Damian. I quite liked how in this film Damian is afraid when he learns who he is and he fights it, I wish it had focused a bit more on his struggle to deal with who he was. I agree, I think it would have been a nice touch if he had talked with his family about it. Isn’t it funny when you revisit childhood films and find out the amazing casts you didn’t notice before? That happens to me all the time with Disney movies. I’m not a big horror fan, but I’m definitely intrigued by seeing Holden here. Thanks for contributing to the blogathon, Gill! Wouldn’t have been the same without you! Thank Michaela, it really is a treat isn’t it. Thats what I find with blogathons too all the time, particuarly with some of those big Golden Hollywood names. This film is now definitely more silly horror than scary it that helps. Thanks for having me in the blogathon – was great fun rewatching (and reviewing) this film. Sure, would be great to honor Ms Grant, especially if I can cover her Oscar winning performance in Shampoo with Warren Beatty and Carrie Fisher! Just read your post – wonderful! Just relived all those movies. Keep in touch via email and we can sort a time out for this! And please DO see Sam Neill in Part 3 again and write about it soon! Thanks Chris, will check out your post – and was totally surprised at Ms Grants age, she’s always such a timeless actress to me. Would you like to join me in honouring her in a blogathon sometime,? really love her movies The Swarm and Airport 77, and love to read more on her work.. Off to check out your review now.